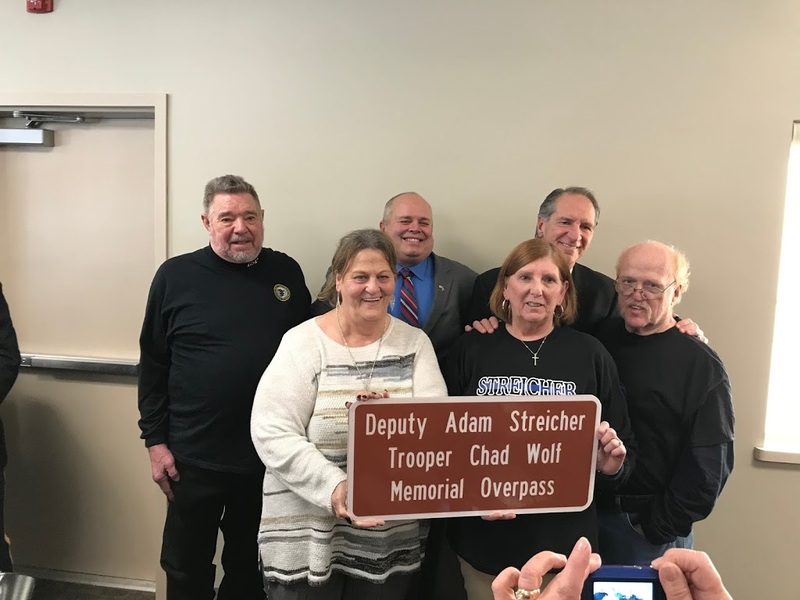 State Representative Dan Swanson and State Senator Chuck Weaver with the family of Trooper Chad Wolf (left- Kyle and Karen Wolf) and family of Deputy Sheriff Adam Streicher (Right- Laurie and Al Streicher) at the Overpass Designation Dedication of the Illinois Route 78 overpass at Interstate 80 on January 17, 2017. Deputy Streicher was 23 years old when he was fatally shot in an altercation in Toulon on March 22, 2002 as he was attempting to serve a warrant. Michigan State Trooper Chad Wolf, 38, died in August 2015 while on duty patrolling in Michigan when he sustained fatal injuries after his motorcycle became entrapped under a utility trailer when it was struck by a vehicle switching lanes. Both were graduates of Annawan High School. 30 law enforcement officers have graduated from Annawan High School and three have been killed in the line of duty. The legislators were joined by officers of Henry County, the Illinois State Police, surrounding counties, and troopers from Michigan as they dedicated the overpass at Exit 33 on Interstate 80 in honor of these fallen officers.